Urban Outreach Bolton – Bolton blessed at Christmas! Home / Urban Outreach News / Bolton blessed at Christmas! In the weeks leading up to Christmas, our warehouse was a hive of activity. Alongside our regular work in sorting food for the Storehouse Food Bank and Winter Watch, food began arriving for our Christmas Dinner on Jesus Hampers. More than 20 schools, churches, businesses and voluntary organisations across Bolton pledged to collect items to make up the Christmas Hampers. School children, employees, volunteers played their part in buying a packet of mince pies, some chocolate mints …even stuffing mix and gravy! We also received many generous financial donations from individuals and groups across the town wishing to support Christmas Dinner on Jesus, so we could buy the fresh items for the hampers. Our Food Team had the unenviable job of coordinating the nominations process! Agencies, churches and other organisations put forward names of people who they were supporting but were struggling because of sickness, redundancy, low incomes and distress and would benefit from receiving a hamper. The hampers were made up by more than 200 volunteers, and were full of wonderful Christmas goodies: a frozen chicken with foil cooking tray, sausages, potatoes, Brussel sprouts, carrots, cabbage, cranberry sauce, stuffing, gravy granules, Christmas pudding, brandy sauce, mince pies, cheese, cheese biscuits, cake and chocolate mints, crisps and drink, clementines, apples, selection boxes and chocolate coins for children, and Christmas crackers! What a blessing of food! 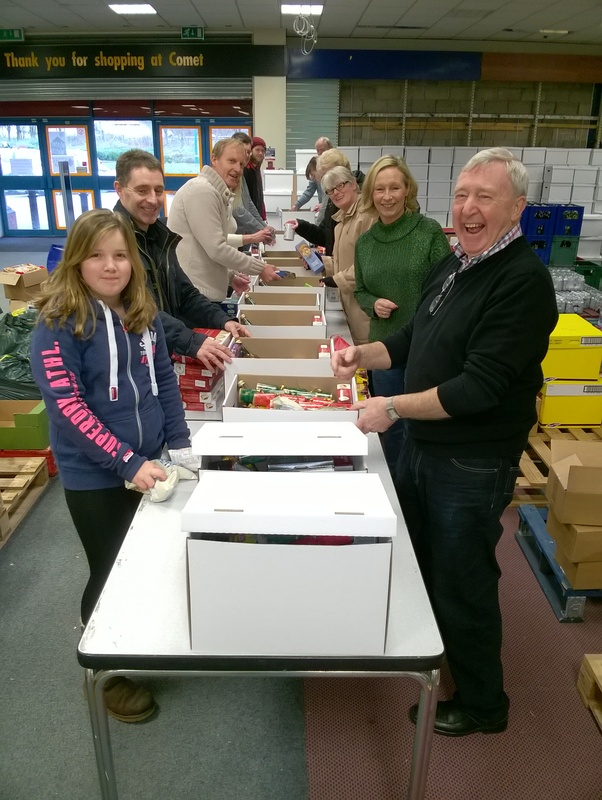 On 23rd December between 11am and 2pm, over 100 different teams/organisations from statutory agencies, housing providers, faith, school and voluntary organisations, who had nominated individuals and families, arrived to pick up the hampers and deliver them. In total 1200 hampers blessed 1907 adults & 1720 children, with 1271 chickens, 4800 clementines & 30,000 Brussel Sprouts! Thank you to the hundreds of people who helped make it happen, and brought some joy into the lives of people who were struggling at Christmas. See photos of Christmas Dinner in action on our Facebook site!